Peer analysis can provide a cross check for the recommendations we derive from more normative analysis. The best peer analyses begin with a narrowly defined population of comparable firms. If the proper care isn’t given to this selection process, the results can prove misleading, as we’ll see in the following example. With a hazy recollection of his college statistics course, an analyst may be tempted to improve the “significance” of his analysis by building a larger peer group. This can backfire. Most companies have very few comparable peers — a handful at most — so we are quick to question analyses against larger populations. Here’s an example of what can go wrong. 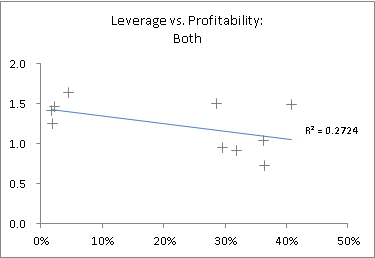 The question is whether leverage helps or hurts profitability. 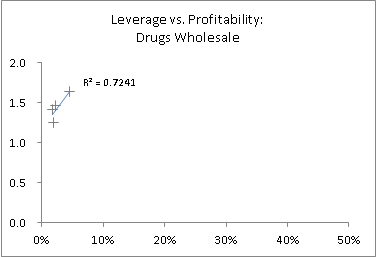 (We define leverage as Debt/EBITDA; profitability as EBITDA/Sales.) 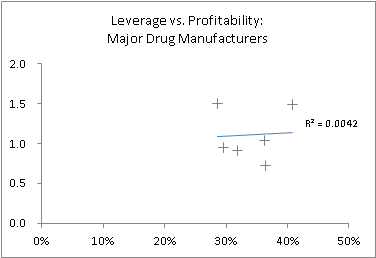 We’ll answer the question by conducting a straightforward univariate regression analysis. This is an example of Simpson’s paradox, which is one of many ecological fallacies which can plague statistical analysis of aggregates.